It came and went, but as usual, it was a great night of action for the RIZIN Fighting Federation’s big New Year’s Eve show. This year, it was RIZIN 14. Of the multiple UFC veterans competing at the event, Justin Scoggins was one of them as he made his promotional debut against Yuki Motoya in a 132-pound catchweight bout. Scoggins came in looking to snap a three-fight losing streak but unfortunately for him, that wouldn’t be the case. Scoggins found minor success on the feet, but once things hit the mat early, Motoya would sink in a tight triangle choke before adjusting it to a rare teepee triangle choke to get the win. The rare submissions weren’t done there though. In a featherweight bout, nephew of the late great Norifumi “Kid” Yamamoto, Erson Yamamoto took on Kazuyuki Miyata. After a technical round one on the ground that saw Yamamoto survive a strong kimura attempt after some slam attempts, it would be in the second where Miyata would end up catching Yamamoto with an inescapable hammerlock from the bottom. After the win, the 42-year old Miyata would announce his retirement. Not a horrible win to call it a career off of. Daron Cruickshank returned to action on this night as he welcomed Aussie slugger and fellow UFC vet, Damien “Beatdown” Brown to the ranks of RIZIN. Both men are known for their striking ability and they showed it as they engaged early and often. Cruickshank would be the one to have the edge with his more diverse offense as he stunned Brown with a spinning back fist. However, despite the success he found for the majority of the round, Cruickshank would shoot a takedown as the round was winding down which led to his demise as Brown sunk in the guillotine and snapped a three-fight losing streak. Also returning to the RIZIN ring was the undefeated BJJ black belt Gabi Garcia who welcomed the striking specialist, Barbara Nepomuceno to the world of MMA. Nepomuceno was able to find a big overhand right early on and continued to search for it after the first one landed but to little avail. Garcia’s strength was the difference maker as her flurries got through Nepomuceno’s defense to get into the clinch. This led to a trip to a quick americana submission win for Garcia. Top light heavyweight prospect Jiri Prochazka fought prior to the first title fight when he took on the short notice replacement in former Bellator middleweight title challenger, Brandon Halsey. After finding early success with his strong wrestling, Halsey held Prochazka down, cut him and had a tight guillotine locked in that Prochazka somehow survived. Taking some big shots on the get-up, Halsey would fall out of the ring seemingly hurt while tangling his leg in the ropes. Halsey continued, went for another takedown but it was fended off as Halsey went out of the ring again but this time fell to the floor and briefly injured his back. The referee deemed the ring escape as intentional which earned Halsey a yellow card point deduction. Prochazka was visibly frustrated by this point as he began to mock Halsey. Halsey claiming he was eye poked shortly after didn’t help either. A shoot in for a takedown and brief scramble led to Halsey finding Prochazka’s back where Prochazka would essentially give him a very tight rear-naked choke that was somehow escaped as well. Prochazka would find his way to Halsey’s back after that where he would find the TKO victory in one of the weirder fights you’ll ever see in MMA. In the first title fight of the night, we got a super atomweight clash between two of the very best in the world in Kanna Asakura and former Invicta FC champion Ayaka Hamasaki. An early eye poke from Asakura caused a scare that the fight may get stopped but Hamasaki took her time and kept fighting. Landing the cleaner and more accurate punches and leg kicks, Hamasaki was able to dictate the action for the entirety of the first round as she fended off Asakura’s takedown attempts with relative ease. It was more of the same in the second before Hamasaki would reverse a takedown attempt to scramble on top of Asakura which led to a slick armbar that forced the tap from Asakura. After that, it was the big cross-promotional title fight as the Bellator bantamweight champion Darrion Caldwell came overseas to look to take out Kyoji Horiguchi to claim the RIZIN title. As expected, once Caldwell got ahold of Horiguchi, he controlled him comfortably and threatened with a deep kimura. Horiguchi escaped and found an opportunity to reposition. A knee attempt from Caldwell gave Horiguchi the chance to get up and he did. The second half of the round is where Horiguchi enjoyed his most success with kicks from distance. The second round saw Caldwell have grappling success once again as he controlled Horiguchi for essentially the entirety of the round but did little to no damage. In the third, Caldwell would find an early takedown once again after absorbing two big punches from Horiguchi, one to the body and one to the head. 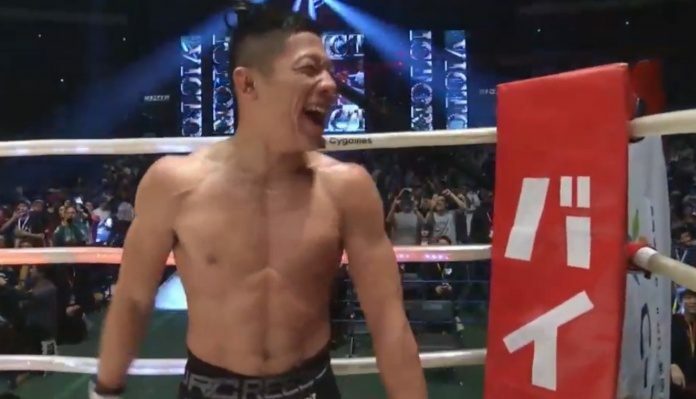 After being taken down, clearly down on the scorecards, Horiguchi would pull off a guillotine to score the comeback win and become the innaugural RIZIN bantamweight champion. Due to a rematch clause in the contracts, Horiguchi and Caldwell will rematch in Bellator for Caldwell’s title.